Hundreds of residents in the South Korean city of Gangneung have been ordered to evacuate their homes as a forest fire rages on the outskirts of the city. The blaze, which started on a hill close to the city’s east coast at around 3:30pm local time Saturday, has so far damaged 30 houses. City officials have ordered some 300 residents to clear the area, South Korea’s Yonhap News Agency reports. Fleeing residents have taken shelter in nearby schools and other public buildings, officials say. Some 2,700 people have been called upon to tackle the blaze, but so far the firefighters, soldiers and police officers have struggled to extinguish it. 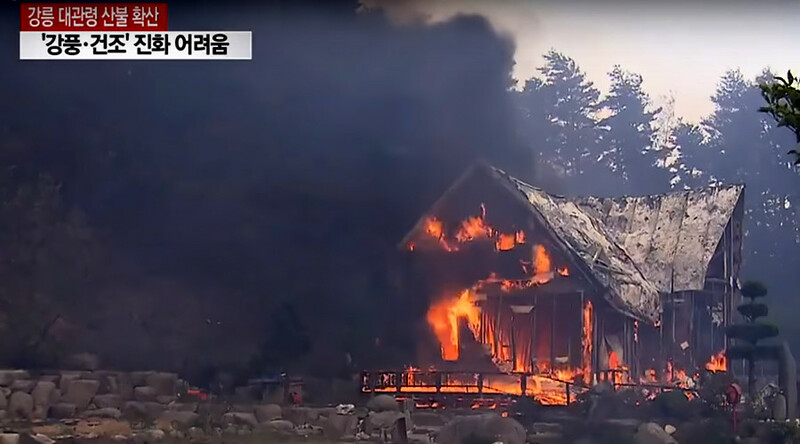 A further 820 people and a squadron of 14 helicopters have been mobilized to put out a fire in the neighboring city of Samcheok, while another fire in the central city of Sangju has continued to burn for over eight hours. The fires come on the same day South Korea’s National Institute of Environmental Research (NIER) issued fine dust warnings for 12 cities in the country. The fall of fine dust Saturday was the worst to hit South Korea this year and blanketed much of the country. NIER advises people to stay indoors or don protective masks if they must venture outdoors.